To achieve the status of Eurolan Authorized Partner, the partner company’s personnel shall include 2 SCS experts. To get a certificate, each expert shall have attended a certification course hold by Eurolan. The Certificate of Eurolan Authorized Partner is issued for 2 years term. 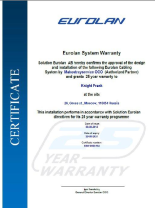 Eurolan Authorized Partner (EAP) status entitles its holder to grant Eurolan’s 25 year warranty for the SCS installed by the partner. Line testing results according to permanent link channel layouts under ISO/IEC 11801 (file format - .flw, test database - Linkware Database). Eurolan reserves the right to inspect Eurolan SCS as a system warranty item and selectively test the installed lines, and after the provided materials examination in case there are no errors or claims, Eurolan shall issue Eurolan SCS Warranty Certificate in 10 days term. The warranty period starting date is the date of installation completion specified in the Registry Form.